Thinking about buying a PC now or in the near future? Then you have the option of taking an XP machine with a Vista upgrade voucher or, after 30th January, getting a Vista box. The upgrade voucher choice has the obvious disadvantage that you'll have the hassle of installing the OS yourself, but as with any new technology, you may have a smoother experience if you bide your time and wait for Vista to bed in. The 657Plus Solar Visto is one of the very first Vista PCs to become available, and Evesham has constructed a system with everything you need to enjoy the new OS. 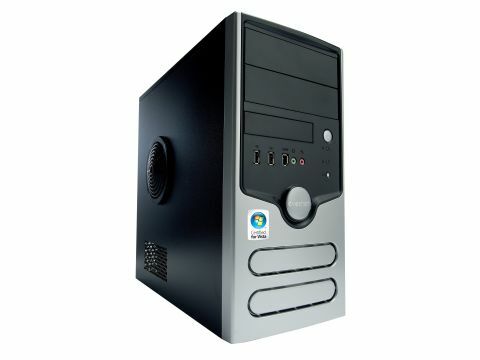 This PC comes with Vista Home Premium Edition, which includes the Aero graphical interface and Media Center controls, as opposed to the Basic Edition which does not. The case of this PC makes it look slightly cheaper than it is. This impression is reinforced by a wobbly fascia that fl exes every time you plug in a USB device. That said, it's not exactly a monstrosity so this aspect doesn't compromise its potential as a lounge-dwelling media centre PC. There's a dual DVB-T TV tuner card, so you can use Vista's Media Center controls with the bundled remote to browse channels. The twin digital tuners enable you to record one TV channel while watching another, which is always convenient. The graphics card is passively cooled and overall the Evesham runs fairly quietly. This system's media centre credentials are further boosted by a splendid, 19-inch widescreen monitor, which is ideal for watching films and excellent for displaying multiple documents. Unusually, this monitor has no DVI connector, just a single VGA input. The bundled Logitech mouse and keyboard are wireless, which is useful for sofa based PC operation. The system is based around a Core 2 Duo CPU, which gives you plenty of multitasking power and there's 1GB of RAM that's supplied as two DIMMs. However, there are no free memory slots so if you want to add more you'll have to replace the sticks already in place. There are three free SATA ports and two free hard disk bays. The front fascia of the case will need to be removed if you want to access those bays to install extra drives, which is a little fiddly. The 256MB nVidia 7600 card is a reasonable offering at this price point - it makes easy work of Vista's Aero interface. All the transparency effects and visual bells and whistles are operational, giving you a markedly improved aesthetic experience compared to an XP system. This setup delivers a Windows Experience score of 4, which is useful to know if you're planning to use any particularly demanding software or games. The specification of the 657Plus Solar Visto is reasonable for the price, and Evesham has made some good decisions to come up with a well-balanced system. Whether you choose this PC will come down to your own personal priorities. You might want a higher-end CPU and more RAM, in which case you'll either pay more or start making compromises, such as choosing a smaller screen. The only disappointment is the case, which is a little drab for a PC at this price point. That aside, this is a versatile system that you could put on your desk for Web browsing, home office, gaming and music, or in the living room for watching TV and films.